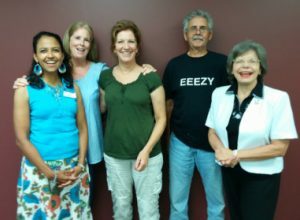 Our newest Sidewalk Counselors are: from Left to Right: Lucia Sadlowski, Paula Allen, Lauri Little, Bob Longhi, and Margie Hogan. There are many different aspects of pro-life ministry, with Sidewalk Counseling being one of the most effective. A trained Sidewalk Counselor is able to engage people entering a clinic, especially the women considering an abortion, and engage them in dialogue to insure that they fully understand the consequences of their actions. They are there to minister the love, hope, and healing in a very difficult and frightening situation. Sidewalk Counseling is not activism or protest; it is being a peaceful, prayerful presence at an abortion facility for the purpose of offering the love and hope to people in one of the most difficult of circumstances. It is an opportunity to reach out to them in an effort to provide them with alternatives to abortion, resources, and loving support without judgment. The forms below are all in Adobe PDF format and require Adobe PDF reader which can be downloaded FREE at www.adobe.com. Once the forms are downloaded they can be filled out on your computer and printed. Application for Sidewalk Counselor – This form needs to be filled out and submitted to Lake County Right to Life at the address on the form along with a $10.00 registration fee. Reference Form for Sidewalk Counselors – This Reference Form MUST be filled out and sent in with the Sidewalk Counselor Application Form. If you are interested in becoming a Sidewalk Counselor, fill out and submit BOTH forms below. Directions for submittal are on the forms.